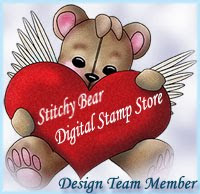 Here is my weekly post with Sweet Pea Stamps. I was blow away by this gorgeous stamp by Ching Chou Kuik "Soft Wind Blows". You can perches this image in red rubber stamp or digital image. I colored image with Distress inks and added distress stickles . This card remind me of Spring, wile winter just don't go away here in Canada.